UFC 217 Results:Georges St-Pierre puts Michael Bisping to sleep for mid..
Home > US Sports > MMA > UFC 217 Results: Georges St-Pierre puts Michael Bisping to sleep for middleweight title! Middleweight title fight between Michael Bisping and Georges St-Pierre served as the main event of tonight’s UFC 217 pay-per-view event in New York. Georges St-Pierre became a two-division champion after submitting former middleweight king Michael Bisping into unconsciousness at UFC 217. 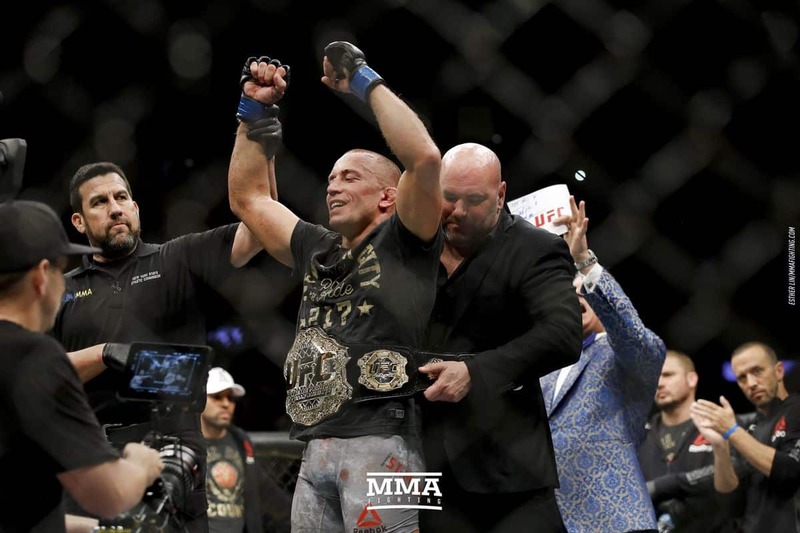 On Saturday night at UFC 217, the former longtime UFC welterweight champion returned to the Octagon for the first time in four years and scored a staggering upset over Michael Bisping to capture the UFC middleweight title. St-Pierre was a two-time welterweight champion. He vacated the belt in Dec. 2013 following a five-year, eight month reign. He joined Randy Couture, B.J. Penn, and Connor McGregor as the UFC’s only-two-weight class champions. Round one: St-Pierre starts things off with a low kick. He lands another. Bisping circles but Georges catches him with another leg kick. “GSP” with a right hand over the top. Bisping circles along the fence. Georges catches him with a side kick. A big right hand just misses for “Rush”. The Canadian side steps and then lands a jab. Michael returns fire with a right hand. “GSP” scores with a jab followed by a front leg round kick. Bisping moves forward and lands a jab of his own. George’s smiles at him. “GSP” with a right hand followed by a crisp jab. St-Pierre keeps searching for a right hand over the top Dan Henderson style. Georges misses with a spinning roundhouse kick attempt. Georges shoots in and lands a single leg take down. Just under a minute remains. “GSP” has Bisping pressed against the fence but Michael quickly wall walks and stands back up. Georges misses with a right hand but then leaps in with a superman punch. He lands a spinning wheel kick. Bisping looks stunned. “GSP” looks great. Round one comes to an end. Round two: George’s land a side kick. He scores with a jab and then another. “GSP” with a solid low kick. Bisping leaps in with a body kick that is partially blocked. The Canadian lands another nice jab. Bisping misses with a right hand. “GSP” with a nice jab. He throws a kick. Michael catches it and lands a nice counter punch. Bisping with a low kick now. He catches Georges with a right hand while St-Pierre was attempting a low kick. “GSP” with a nice jab now. Georges shoots in and scores a take down with just less than two minutes left in the round. St-Pierre moves immediately to half guard. Bisping is able to scramble and get back up to his feet. He lands a nice right hand on “GSP”. Bisping with a nice left hand. St-Pierre throws a kick but Bisping catches it. Michael leaps in with a jumping side kick. It partially lands. Georges is slowing down. Round two comes to an end. Round three: George’s lands a low kick. He shoots in and after some hard work drags Michael to the floor. “GSP” is working from full guard here. Bisping lands an elbow from the bottom that busts open St-Pierre. “GSP” lands a hard elbow. He throws a right hand followed by another elbow. Bisping is looking to scramble. He lands another big elbow from the bottom and “GSP” is now a bloody mess. Bisping scrambles to his feet. GSP lands a jab. Bisping responds with a right. Another jab from St-Pierre followed by a right hand over the top. Just less than two minutes remain in round three. Bisping lands a good jab. Georges replies with a side kick followed by a low kick. GSP knocks Bisping to the floor with a punch. GSP is all over him with ground and pound. Bisping gives up his back and locks in a rear-naked choke. He puts Bisping to sleep! The time of the submission finish at New York’s Madison Square Garden was 4:23 of the third round as St-Pierre (26-2) became just the fourth fighter in UFC history to hold championships in two different weight classes. St-Pierre looked in vintage condition in the opening round. With Bisping backing off and respecting St-Pierre’s vaunted wrestling game, St-Pierre landed jabs at will, then a take down late in the round. “This is not really my real weight, you know? I did it for the challenge,” St-Pierre said. In The Conclusion with the win, St-Pierre tied Bisping for most UFC victories with 20. Bisping (30-8), who had held the title since June 2016, had a five-fight win streak snapped.